1851, 1¢ black, type I, trial color large die proof on India, mounted on card (41 x 40mm), fresh with deep color, reverse with pencil notation "From J. E. Ralph." and signed J. M. Bartels, Very Fine, listed but unpriced in the Scott catalog, ex-Wagshal. Scott No. 5TC1ae Estimate $7,500 - 10,000. 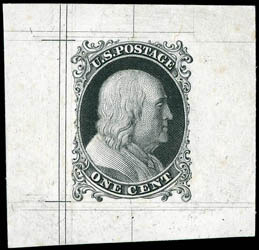 ONE OF TWO KNOWN EXAMPLES OF THE 1851 1¢ TYPE I TRIAL COLOR LARGE DIE PROOF IN BLACK. 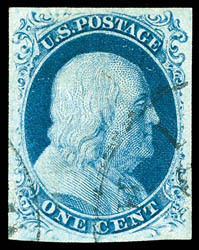 In Neinken "U.S. One Cent Stamp of 1851 to 1861", he notes that it his opinion that this rare proof came into existence after 1857 and believes that this die was especially made for the 1875 reprint issue. The notation on reverse refers to a Bureau of Engraving and Printing employee who was known to have distributed a number of die proofs back in 1910. 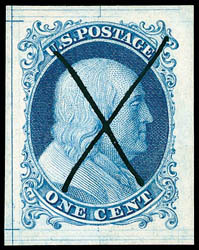 1851, 1¢ blue, type I, large die proof on India, 24 x 30mm card, showing die layout line around design, rich vibrant color, manuscript "X" control mark, Extremely Fine and choice, ex-Brazer. ONE OF THREE KNOWN EXAMPLES OF THE 1851 1¢ TYPE I LARGE DIE PROOF. 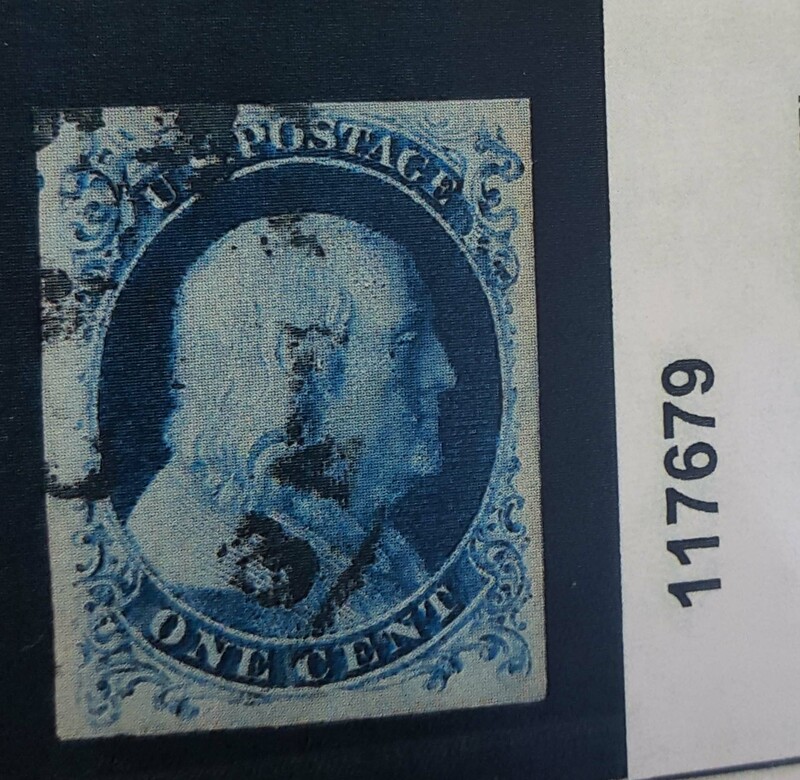 In Neinken "U.S. One Cent Stamp of 1851 to 1861", he notes that it his opinion that this rare proof came into existence after 1857 and believes that this die was especially made for the 1875 reprint issue. 1851, 1¢ blue, type II, socked-on-the-nose town cancel, margins large at bottom to huge around encompassing portions of adjacent stamps, bold color and crisp detailed impression, a Superb jumbo; with 2015 P.S.E. Graded certificate (Superb 98J, SMQ $3,200). 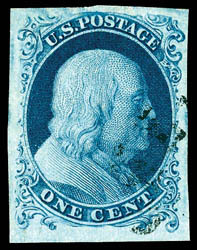 A MAGNIFICENT LARGE-MARGIN EXAMPLE OF THE 1851 1¢ BLUE TYPE II. 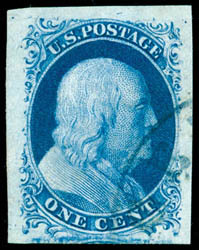 1851, 1¢ blue, type II, dropped relief double transfer, position 1L2, neat town corner cancel, huge margins showing portion of adjacent stamp at bottom, exceptional crisp early impression clearly showing the drop relief at top and the start of surface cracking of the plate, rich intense color on bright paper, a Superb gem; with 2013 P.S.E. Graded certificate (Gem 100, SMQ $4,200). Scott No. 7 var. $150. A TRULY OUTSTANDING EXAMPLE OF THE 1851 1¢ TYPE II SHOWING THE POSITION 1L2 DROPPED RELIEF. This position on plate 2 sits just to the left of the top of the so called "big crack" plate flaw, and is believed that this drop relief is the cause of the big crack plate flaw that developed on this plate. This position is a unique double transfer in that no re-entry actually shows on the design itself, rather the bottom portion of the relief transferred to the margin above this position. 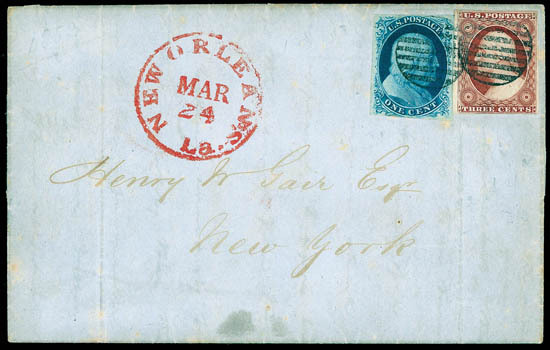 1851, 1¢ blue, type II, plate 1E, with intense color from the late printing, large margins to just in at top, used with 3¢ brownish carmine (11A), tied to each other by two strikes of circular grids on 1852 folded letter to New York, bold red "New Orleans La. Mar 24" cds; 3¢ affected by file fold, a Very Fine usage showing prepayment of the 1¢ carrier fee, ex-Smith, Vernon Morris. 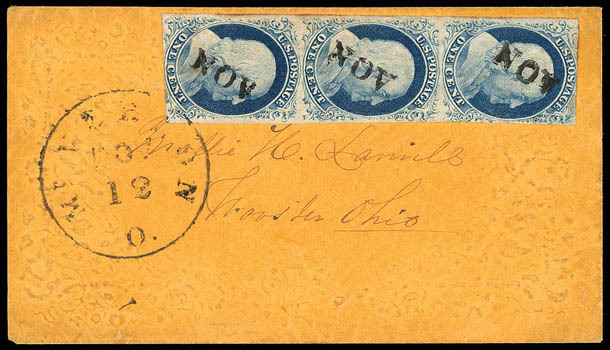 1851, 1¢ blue, type III, plate 4, light neat town cancels, large even margins, gorgeous rich deep color and detailed impression clearly showing the characteristic frameline breaks at top and bottom, Extremely Fine to Superb, ex-Tahoe; with 2012 P.S.E. Graded certificate (XF-Sup 95, SMQ $8,500). 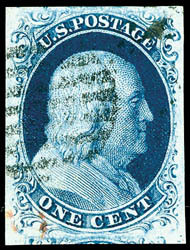 A MAGNIFICENT LARGE MARGIN USED EXAMPLE OF THE 1851 1¢ TYPE III ISSUE. 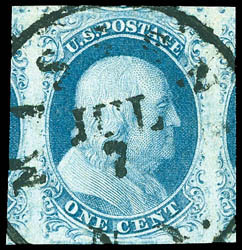 1851, 1¢ blue, type IIIa, position 19R2, showing clear break between the left side of "O" and right side of "S" at top, neat grid and small portion of red transit cancels, large to huge margins showing portions of adjacent stamps at top and bottom, strong impression and deep bold color, Extremely Fine to Superb, a wonderful gem stamp; with 2001, 2013 P.F. certificates and 2001 P.S.E. certificate. 1852, 1¢ blue, type IV, block of 8, positions 86-89/96-99R1L, red California town and manuscript cancel including addressing to Utica, N.Y., wide side margins to just in at top and bottom, bright color, small tear at top affecting second stamp, Fine and attractive, a rare multiple from California. Scott No. 9 $3,500 for two blocks of 4. 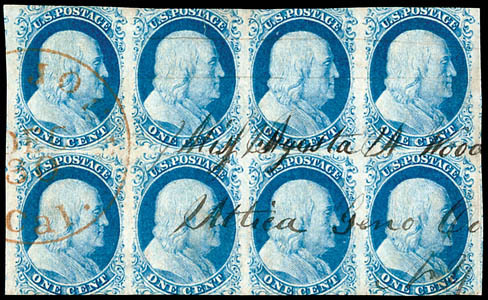 1852, 1¢ blue, type IV, vertical strip of three, wide margins except slightly in at top and bottom, beautiful color, each stamp neatly cancelled by bold "NOV" month slugs and strip tied by "Mt. Vernon, O., Nov 12" cds on orange flower embossed ladies envelope to Wooster Oh., Extremely Fine, ex-Krug, West. Scott No. 9 Estimate $1,000 - 1,500. A GEM USE OF THE 1851 1¢ TYPE IV ISSUE FROM MOUNT VERNON.